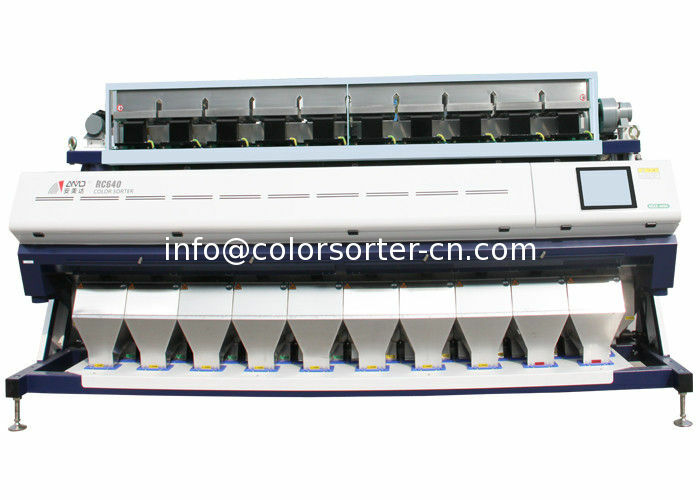 Optical Sorting Machine(sometimes called digital sorting) is the intelligent and automatic process of sorting solid material using cameras and ejectors. Our comprehensive knowledge in the field of coffee production combined with its creative solutions offer coffee processsors the most advanced technology solutions. We could help the coffee processors to meet strictest food safety and quality requirements.At the same time ,it maximize the productivity and profitability. Depending on the types of sensors used and software-driven intelligence of the image processing system,optical sorting machine can recognize objects' color and size.The sorter compares objects to user-defined accept/reject criteria to identify and remove defective products and foreign material(FM) from the production line,or to separate product of different grades or types of material. CCD Color Sorters are widely used in the food industry globally,with the highest adoption in processing harvested foods such as grains,cereal,seeds,beans,rice,pulses,spices,nuts,dehydrated vegetable.The technology is also used in waste recycling and mineral industry.Compared to manual sorting,which is subjective and inconsistent,optical sorting helps improve product quality ,maximize throughput and increase yields while reducing labor costs. Optical Sorter machine is ideal for grain processors who sort different varieties of grains and at different processing stages.The sorting range is suitable for processors who demand the highest quality. In general,optical sorters feature four major components:the feed system,the optical system,image processing software and the separation system.The objective of the feed system is to spread product into a uniform monolayer so products are presented to the optical system without clumps,at a constant velocity.The optical system includes lights and sensors housed above and/or below the flow of the objects being inspected.The image processing system compares objects to user-defined accept/reject thresholds to classify objects and actuate the separation system. Use the high resolution CCD camera with high quality industrial lens to achieve clear and accurate image acquisition .The camera could capture the micro defects of material instantly. Use high signal-to-noise ratio sensor and anti-interference circuit system,which could highly improve stability and reliability. Color sorting algorithms of gray level,color difference and HSV are perfectly combined with shape sorting algorithms of size,circular degree,texture etc,and successfully solved a series of high difficulty color sorting problems,and dramatically enhance the sorting accuracy. The special anodizing and hardening technology can greatly improve the channel smoothness and ware resistance to guarantee high production. Equipped with high quality solenoid valve.The valve has longer lifespan ,high frequency ,and low air consumption.The working frequency is 1000 times per second,which guarantees the accurate and perfect ejecting. For the different sizes and characteristics of material particle, Our optical sorters use the solenoid valve of different sizes. Advanced LED lighting technology with advantages of super high intensity,long lifetime and perfect performance. Simple optical system design, precise automatic correction system, combined with the well-designed human-machine interface to simplify the complexity of machine commissioning and use.Our machine is intelligent so it can learn by itself.Our machine can take a photo of the material and then the machine could set the paramaters by itself. 1,Green coffee(colour sorting):Optical sorting can reject colour defects such as discoloured beans,immature and insect damaged beans in ordinary,specialty and sundried green coffee application. 2,Green coffee(FM sorting):Optical sorting can remove foreign material which has been missed or not targeted by the mechanical cleaning process such as sticks,stones,glass,shell and others caused by fermentation process such as sour beans. 3,Roasted coffee(colour sorting):Optical sorting can separate under-roasted(lighter,white and immature) and over-roasted beans for a better taste and quality. 4,Roasted coffee(FM sorting):it can remove FM(foreign material) such as sticks,stones and glass from roasted coffee which can not only compromise the appearance of the final product but can also damage mechanical equipment such as grinders.